Colors with name have the advantage of carrying meaning which can be helpful for choosing good colors. The meaning is probably shared by people speaking or knowing the same language because color names are tied to language boundaries. Of course, this can be an advantage and a disadvantage at the same time. Knowing colors by name also helps building up the set of colors one is conscious to. On average people can tell ten to twenty colors spontaneously. Growing that list to about 50 to 300 makes using color more intuitively. For a one-page overview we prepared a full color chart ordered by name with useful color properties. But wait, you might find it more useful to browse color names by hue ranges and luminance (perceived brightness). 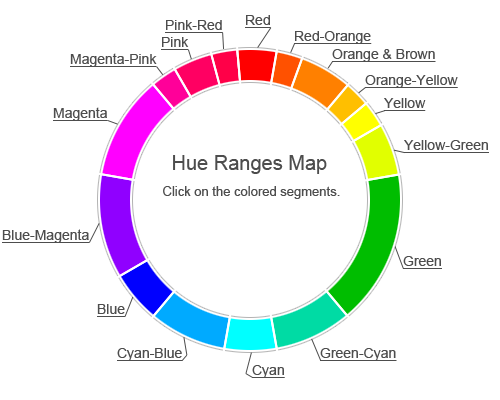 Please use the HEX, RGB or HSL values of the colors as HTML color code or CSS color code. For documents / applications the quickest way to use a certain color is to copy its HEX value and paste it into a designated input field. The color pages contain several color properties like RGB, HEX and HSL values. This way you should be able to use the colors for most applications. The luminance value of the colors allows checking for appropriate perceived brightness contrast in advance. Read more about color luminance here. Color names allow us to characterize color in a more natural way compared to properties of color models. This comes in handy for color choosing, color identification and in communication. In practice this compensates for the lack of accuracy of such characterization. Browsing colors by name is a great method to gain inspiration.